The defendants are accused of driving to Key West from West Palm Beach on or about August 18, 2010, and entering the Mel Fisher Maritime Heritage Museum. It is alleged that Jared Alexander Goldman, 32, of Palm Beach Gardens stood guard as a lookout to enable Richard Steven Johnson, 41, of Rio Linda, Calif., to steal the gold bar. Johnson then allegedly removed the gold bar from its display case at the museum and both defendants then drove back to West Palm Beach. The gold bar has not been recovered. 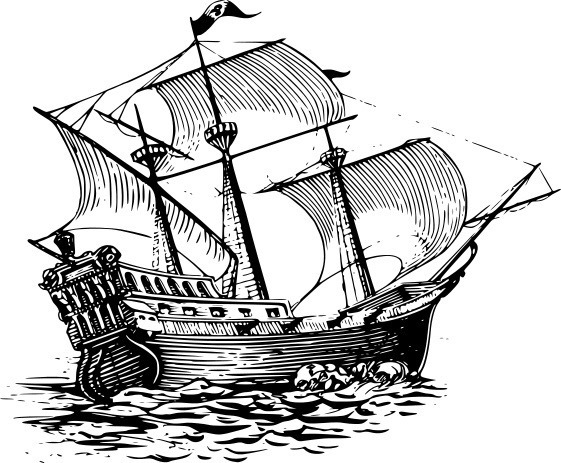 The 75-ounce bar was originally found in 1980 in the wreck of the Spanish galleon Santa Margarita, which sank in 1622. It had been on display in an acrylic case that allowed museum visitors to lift the bar. It had been valued at $550,000. More about the museum can be found here. Just to set the record straight, there is no chance of finding the legendary Lost Dutchman’s Mine within Lost Dutchman’s Sate Park. And that’s a good thing, considering the doom that befell those who found or searched for the fabled treasure trove in the Superstition Mountains east of Phoenix. The area had been explored by the Spanish against the wishes of the Apache who held the mountains sacred, mined for silver and gold by a Mexican cattle baron and his descendants until around 1847 when they hid the mine fearing an Apache attack and annexation by the United States at the conclusion of the Mexican-American War, only to be discovered later by Jacob Walz (or Waltz), a German immigrant who was mistaken for a Dutchman (Deutsch man, Dutch man, what’s the difference) and who was known to roll into town every now and again laden with gold-rich ore in 1870s. Walz’s home (we are using the short version of the surname to conserve valuable “t”s) was caught in a flood in 1891, and he died later that year following a lengthy illness, but not before giving clues to the mines location. The hunt for the gold was back on, and the journey that followed is littered with headless skeletons, decapitations, disappearances, reappearances sans head, suspicious gunshot wounds, falling rocks, vague landmarks and cryptic carvings too numerous and tangled to recount here (see link below), suffice to say the evasive legend lives on. 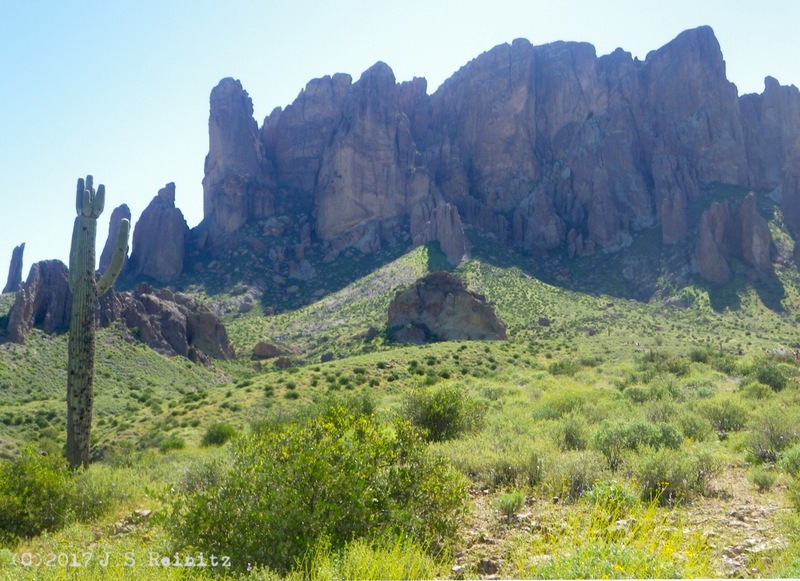 Today, the historic miner with a misidentified country of origin is a state park on a swath of the Sonoran Desert in the shadow of the Superstition range. There is a campground, small welcome center and picnic areas. Most of the hiking trails are in the adjacent Tonto National (Cactus) Forest, as is the range itself, so mining is prohibited, as is removing anything from the federal land, down to the most insignificant pebble. If you find the mine, you can’t take any gold, but you get bragging rights and can apply for a junior park ranger patch. As I handed the park employee the entrance fee, I asked about the estimated hiking time to Green Boulder, an outcropping with a 2,580-foot elevation (according to the map, which also instructs us not to shoot firearms near trails — so we can shoot if we are far from trails? — and to stay out of mine shafts — so maybe the mine is here somewhere?). He suggested a time and trail beyond what we had planned to spend. We opted for a shorter walk and passed an oil painting class in a picnic area and made our way under towering saguaro cacti. My 14-year-old son learned about the jumping cholla cactus the only real way to fully understand and appreciate the jumping cholla cactus and why it is called jumping — by getting close enough to catch a pointy spine. Only one needle found him, and it only found the tip of his finger just after we warned him to keep his distance. Easily removed. This was lucky because the jumping cholla, also called the teddy bear cactus, is known to decimate small villages, according to this TV report. After a little walking on our short trail, we decided our trail was too short. Green Boulder loomed not far off at the end of a path. It wasn’t the roundabout path the ranger had suggested, this was straight shot. My son and I decided to try it while the others chose to stay in the lowlands. It turned out to be longer than we thought, but we made good time. We enjoyed the view of the cities off on the horizon, caught our breath and rested our tired legs. Sometimes treasure isn’t measured by dollar signs. The view was golden. 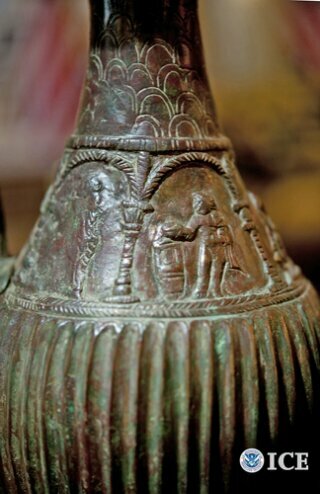 The people of Afghanistan are getting ancient gold ornaments and an old Roman wine pitcher that had apparently been looted from the country and discovered in the United States as part of an investigation into antiquities trafficking. Earlier this month, the items were officially returned to Afghan authorities during a ceremony at their embassy in Washington, D.C. 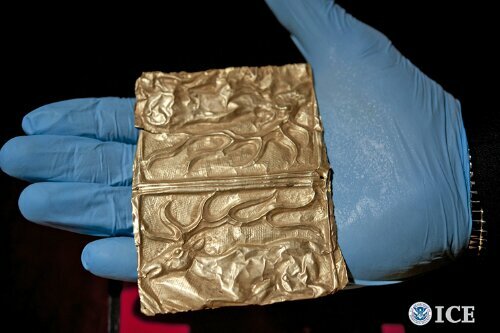 According to the Immigration and Customs Enforcement officials, border protection officers discovered the artifacts in a shipment at Newark Liberty International Airport in March 2011. The investigation revealed the items were headed for a New York man to be passed on to another New Yorker suspected of “dealing in looted cultural property,” ICE officials said. The vase is a 12.75-inch Roman oinochoe, or wine pitcher, from the 5th to 8th century A.D. Also returned were three 4-by-3.25-inch 5th century B.C. gold foil appliques depicting antelopes and two antique coiled gold ornaments from approximately the 17th century, weighing approximately one pound. This marks the four repatriation of looted property to Afghanistan. — A late 19th century historic “jezail” rifle ammunition speed loader returned June 2013. The ammunition speed loader had disappeared from the Kabul National Museum in the years after the Soviets withdrew from Afghanistan. — Eight Bronze Age circa 2,000 B.C. artifacts returned in May 2008. The artifacts, likely looted from northern tombs, had been illegally removed from Afghanistan and sold in the United States. — Two rare coins returned in May 2005. They were estimated to be more than 2,000 years old and were looted during the unrest following the departure of Russian forces in 1988. The Indo-Greek coins of Agathokles, dated between 171 and 160 B.C., were looted from Kabul Taliban factions. Disembodied hand holding foil appliques depicting antelopes that were returned to Afghanistan. Photo courtesy of Immigration and Customs Enforcement. This bronze tumi knife was used in Pre-Inca sacrificial ceremonies in what is now Peru before it was swiped and brought to the U.S. Last week, the tumi and other loot, some of which was listed on eBay, was returned to Peruvian authorities. Photo courtesy of U.S. Immigration and Customs Enforcement. A few months ago, we wrote about a gold bell shaped like a monkey head that was on its way back to Peru after being looted. Last week, U.S. customs officials announced the monkey head, which was made by the Moche culture some 1,500 years ago, now has some company. Another looted hoard being repatriated to Peru includes a bronze tumi sacrificial knife, a woven belt, a Moche whistling bowl as well as other pottery and some more recent (1700s ) paintings. A Thursday ceremony at the Peruvian embassy in Washington, D.C., marked the occasion. “The plundering of cultural property is one of the oldest forms of organized cross-border crime and has become a world-wide phenomenon that transcends frontiers,” Immigration and Customs Enforcement Director John Morton said in a prepared statement. The looted artifacts were recovered in the course of five separate investigations by special agents of ICE Homeland Security Investigations in New York; W.V. ; Wilmington, Del. ; and Austin and Houston, Texas, officials said. Federal agents determined the items were removed from Peru and brought to the United States in violation of laws in both countries, including statues that restrict the importation of pre-Columbian artifacts and colonial-era religious objects into the United States without proper export documents. Where did the feds find the stuff? Authorities said some was listed by prestigious auction houses. And some, it appears, was for sale on eBay. The monstrance — a Eucharist receptacle — was stolen from St. Stephen the Martyr, a small Catholic church in Yaurisque, located in the Cusco region. The Moche ceramic jar and the tumi knife were consigned by an estate trust in order to be sold at an auction house in Madison, N.J.